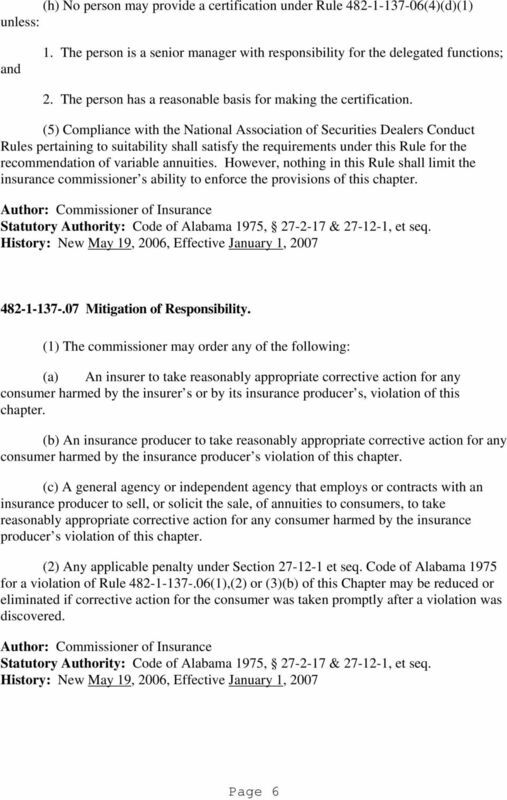 Download "ALABAMA DEPARTMENT OF INSURANCE INSURANCE REGULATION CHAPTER 482-1-137 SUITABILITY PROTECTION IN ANNUITY TRANSACTIONS"
2003 National Association of Insurance Commissioners Table of Contents RULE AND REGULATION 82 SENIOR PROTECTION IN ANNUITY TRANSACTIONS Section 1. Section 2. Section 3. Section 4. 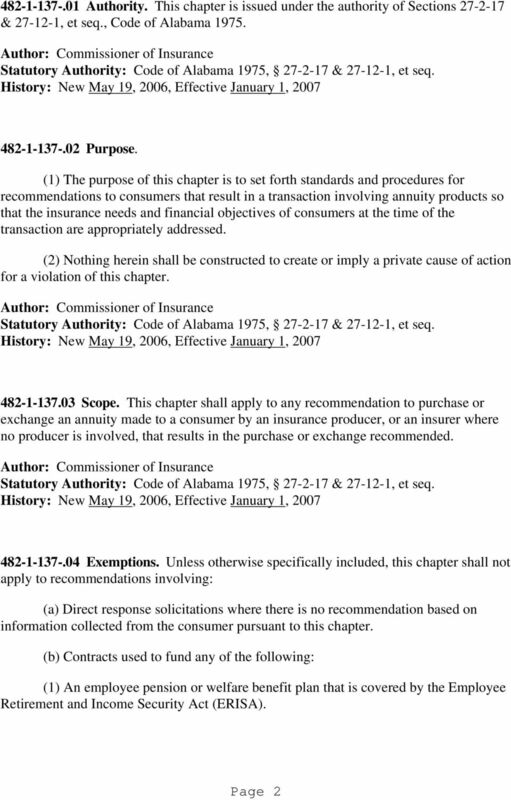 Section 5. Section 6. 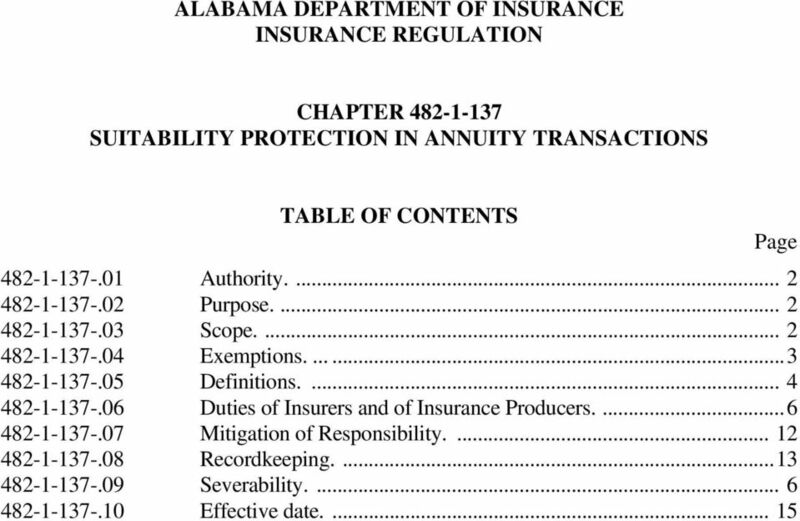 02 DEPARTMENT OF PROFESSIONAL AND FINANCIAL REGULATION 031 BUREAU OF INSURANCE Chapter 917: SUITABILITY IN ANNUITY TRANSACTIONS Table of Contents Section 1. Section 2. Section 3. Section 4. Section 5. History: Add. 2006, Act 399, Imd. Eff. Sept. 29, 2006; Am. 2012, Act 544, Eff. June 1, 2013. CHAPTER 88. 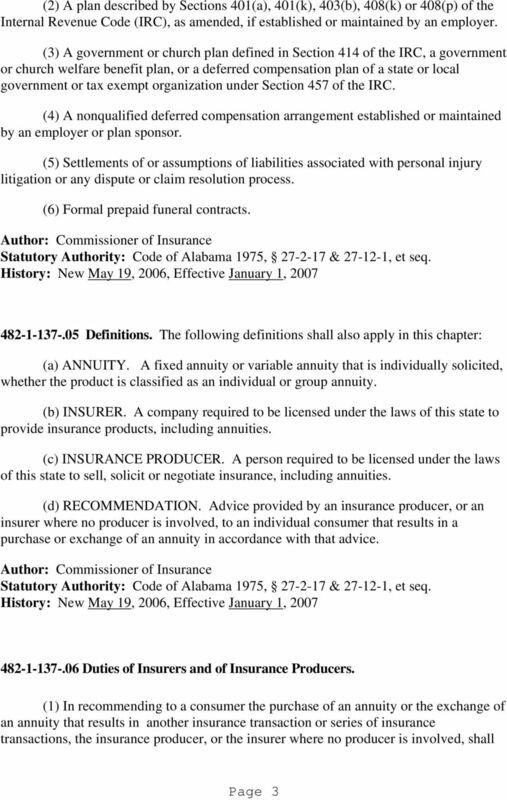 AN ACT concerning certain annuity products, and supplementing chapter 25 of Title 17B of the New Jersey Statutes. 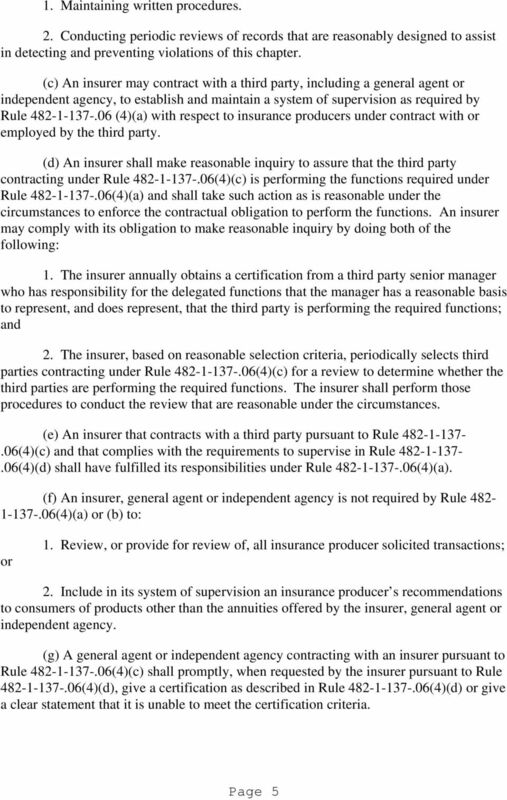 ANNUITY SUITABILITY WHY REGULATORS ARE CONCERNED Wisconsin Office of the Commissioner of Insurance Agenda Why regulators are concerned about suitability. When may a sale be unsuitable. Serious violations. 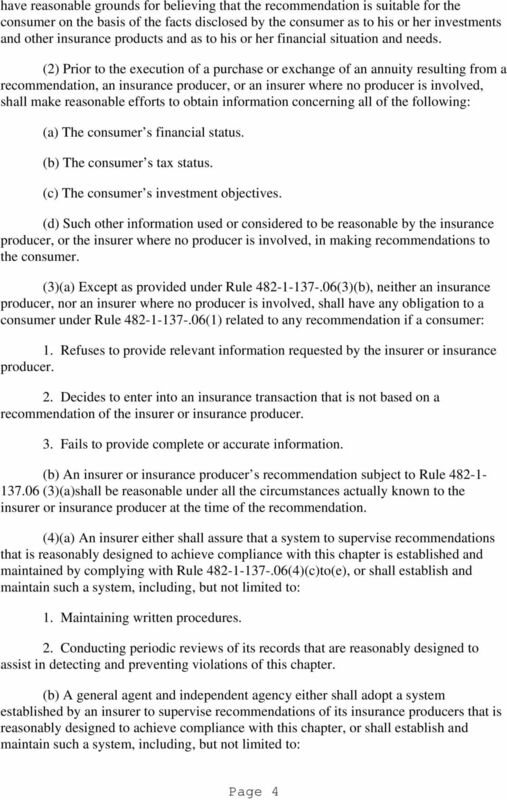 Title 210 -- NEBRASKA DEPARTMENT OF INSURANCE Chapter 33 -- LIFE INSURANCE SOLICITATION 001. Authority. 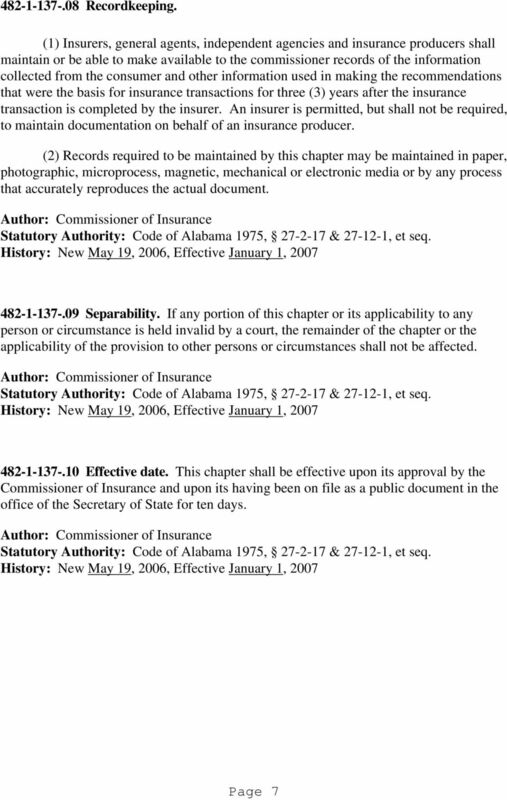 This rule is adopted and promulgated by the Nebraska Department of Insurance pursuant to NEB. REV. (a) Definitions. As used in this Section, the following terms have the meanings set forth below. Part 15 Structured Settlement Protection Act 78B-6-1501 Title. This part is known as the "Structured Settlement Protection Act." 78B-6-1502 Definitions. For purposes of this part: (1) "Annuity issuer"
the Seibel Act, Safeguard Our Seniors Act, Regulatory Framework 2011 Wall Street Instructors, Inc.